Pit Stop USA is The Online Motorsports Superstore! System 1 Filters have been and continue to be extensively tested in the harshest and most demanding environments since the early 1980's. World Champions in NASCAR, NHRA, Sprint Car and Monster Truck, Tractor Pulls, Offshore Marine, and others have trusted their $70,000+ engines as well as their $500,000 CNC manufacturing equipment to System 1 filters. The System 1 Filter spins onto the existing receptacle and requires no special tools. The cleaning of the System 1 filter element can be done effectively by with soap and water. 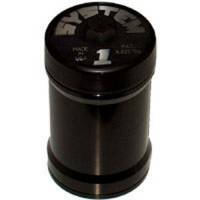 The System 1 filter is designed to last a lifetime. The tough cast aluminum housing can withstand abuse making it the perfect choice for military, construction, agricultural, industrial, and marine applications where you cannot afford to have any problems. Our military customers also benefit by eliminating the need for bulky inventory taken into the field. Another unique feature of the System 1 filter system is that it can be used as an inspection tool. It is very easy to see what is going on inside your engine. We have heard from many customers who are amazed at what they find trapped in the filter and have a early warning mechanism to potential problems inside. System 1 Cast Chevy Adjustable Oil Pumps feature Anti - Aeration, Adjustable oil pressure from 75 to 125 psi, Bypass oil anti-aeration diffusion screen technology and are availalbe for Small Block Chevy and Big Block Chevy engines. System 1 Cast Chevy Oil Pumps with Adjustable Pressure are the industry's finest cast pumps. System 1 Billet In-Line Fuel Filters use pleated stainless steel mesh 30 micron filtering. System 1 Billet Remote Oil Filter Mounts are a perfect choice for mounting the System 1 Oil Filter in a remote location. We feature System 1 Oil Filters, System 1 Fuel Filters, System 1 Oil Pumps and System 1 Remote Oil Filter Mounts at low everyday prices!